KAMAG supplies three Industrial Lift Transporters to the company Yesilyurt, in Turkey. The three industrial lift transporter KAMAG 2107 HM2 with tilting device and overhead cab are ideally prepared for the adverse working conditions in the steel mills. The pendulum axles with hydraulic compensation always ensure the necessary stability, whereby the safety systems strike an alarm with stroke differences of more than 60 mm. But this is just one of many safety features - different systems always inform the driver about all driving conditions and possible dangers. 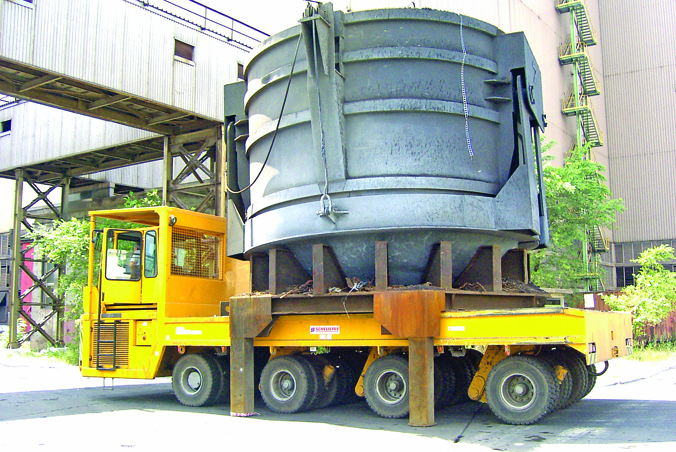 With a tiltable payload of 100 tonnes and a comparatively low deadweight of only 50 tonnes, the KAMAG 2107 HM2 with overhead cab is one of the most efficient Industrial Lift Transporters for handling scrap or other bulk material. With 421 hp, driven by the proven CATERPILLAR units for decades, the models supplied to Yesilyurt achieve an impressive gradeability of 12 percent and a traction force of 332 kN.